When we gathered the top travel data professionals in Europe and asked them what they thought would change the face of our industry, they overwhelmingly answered that data-driven personalization would be the game changer. Some 78% of the attendees at our Smart Travel Data Summit 2016 believed that personalization would be critical in the future, far ahead of any other category, and it was a topic that came up time and again at the conference. You can download the full conference report here, which covers all the major themes, surveys and presentations from the conference. EyeforTravel have an attendee list for the digital travel elite that you need to see! EyeforTravel have just released their attendee list for the San Francisco Summit 2017 (April 24-25). Don’t miss your chance to join the west coast’s largest digital travel conference. The focus of this event is mobile, social media and tech innovation. With more travelers turning to the internet and mobile to get ideas, inspiration, and options for their trips. Mobile has made the journey more spontaneous with ‘on the go’ research tools. Research shows that 85% of leisure travelers decide on activities only after having arrived at their destination. With mobile playing such a key role we see platforms like Facebook, Lola, Instagram, Hopper, Lyft, YouTube (travel hack videos) SnapChat, and travel supplier’s bespoke apps like Hilton and KLM becoming the starting block of a traveler’s journey. EyeforTravel are excited about this shift and have positioned their EyeForTravel San Francisco Summit (April 24-25) to focus on the digital big bang in travel. The event will have 350 travel decision makers to help you identify the data, technology, partners and strategies that you need to grow revenues in the mobile-first world! They are even offering a sneak peak of their attendee list 2 months before the event. Want to see who you might be sitting next to? This year’s conference will be 3 in-depth travel conferences all in one! If this appeals to you, get involved either as an attendee, a speaker or an exhibitor. Is Cuba's US tourist boom over before it begins? One of Obama’s major foreign policy objectives was rapprochement with Cuba, leading to a relaxation in travel restrictions between the two countries through a process known as ‘normalization’. This has led to a huge jump in US tourists to Cuba, with the island’s already growing tourism entering a full-blown boom in 2016. The Miami Herald reported that “visits by Cuban Americans and other US travelers last year was 614,433, a 34% increase,” making them the second biggest visiting nationality. American Airlines has even opened a Havana office in a sign of the changing times. However, President Trump is furiously signing in executive orders, overturning many of the key initiatives of the Obama administration. President Trump has threatened to halt the process of normalization “unless the Castro regime meets our demands”, so if you are an American looking at Cuba, now might be the time to go before it’s too late. Technology with a human touch: travel’s new super power? Pamela Whitby has been finding out if the days of purely self-serve online travel are over. “Metasearch on steroids,” is how industry veteran Krista Pappas, the vice president of Lola, describes the firm’s new agent console, a state-of-the-art piece of kit that delivers “super powers” to the group’s living-breathing travel agents. The console, which communicates back and forth with Harrison, Lola’s artificial intelligence (AI) engine – its answer to IBM Watson – gives the firm’s 20-strong travel agent team “all these new, amazing and efficient tools”. Tools that will help Lola, a startup leading the charge away from purely self-serve online travel, to deliver a truly personalised experience. Though she isn’t naming or shaming anybody, the travel industry veteran’s argument goes that whether you like it or not, the results of the agencies are influenced by who pays the highest commission. This isn’t easy but with a further $15 million awarded in recent Series B funding, taking Lola’s total investment to just under $35 million, the tech-driven vision seems within reach. As a quick recap, Lola launched its limited beta version in the app store in May 2016. Led by former Kayak co-founder Paul English, Lola’s target audience is the tech-savvy frequent traveller, fed up with having to sort through the thousands of generic search results spat out by well-established OTAs. Though everybody in travel is talking about ‘personalisation’ more often the results don’t deliver, and end up costing travellers time and productivity. Following feedback, the next iteration will also include significant changes to the user experience. “It’s truly a mobile-first user experience versus just a mobile-adaptation of a 20-year-old idea of search,” she continues. Of course, there are some simple, easy-to-complete tasks, such as booking a regular weekly business trip from Boston to JFK, but there are still enough times when things go awry. “When a flight is cancelled, and you’re stuck in a cab, or there is a problem with hotel check-in, people absolutely do want to talk to an agent and with Lola, 24/7 service is always one touch away,” Pappas insists. In essence then, Lola is now set on building a true personalisation engine for hotels, flights and other travel components that will deliver a “self-service travel plus agent” model. This trend away from pure self-serve travel is one that Jared Alster, VP and co-founder of San Francisco-based startup Stride Travel, a go-to market place for baby boomers, sees playing out in 2017. Lola’s investors also seem convinced. In the latest funding round, led by Charles River Ventures, previous investors General Catalyst and Accel both came back to the table. Want to learn more about AI in travel then join our EyeforTravel San Francisco Summit this April - Click here to learn more. The numbers seem to back this up. According to Statista, by August 2015 at least 2.5 billion people were using at least one messaging app, a number that’s expected to grow to 3.6 billion by 2018. The real test now, however, will be how this upstart tech company harnesses AI, machine learning and natural language processing to perfect the messaging experience. Lola is definitely “the real deal”, insists Pappas who says we can expect to see a lot more than talk in 2017. To advance the firm’s AI ambitions, last September last year came another “best-of-breed appointment” to the executive team in the form of Bryan Healey, a former Amazon Echo technology leader. “Our AI team’s ability to help with personalisation and natural language processing for a better messaging experience will be paramount,” Pappas says. While some industry players are calling 2017 as the year that the mobile native app dies out, Lola doesn’t buy into this view. “The other part of our tech vision is the mobile app – so it’s Harrison, agent, console, mobile app,” Pappas says. Importantly though, the human agent will always be there to “ensure that Harrison is getting it right”. To ensure this happens, Lola has adopted an approach which helped Kayak to take the tech lead – insisting that engineers sit with the agents to hear first hand the customer’s pain points in order to build the most effective solutions. That humans will remain central to this fledgling business is an important one in the current climate. Recently the Financial Times reported on the pressure being felt by senior Silicon Valley executives at the World Economic Forum in Davos. With Brexit and the election of Trump, here executives including the chiefs of IBM, Salesforce.com and Microsoft were anxious to present themselves as more responsible and sympathetic to the potential impact of AI. Salesforce.com’s Marc Benioff is quoted saying that “advances in AI are beyond what we had expected,” and the concern is that it could lead to job losses. In travel, however, Pappas argues that this is less of a problem. “Booking travel is inherently complex and we believe there are always going to be things that humans are better at doing than the engine,” she says. Yes, lots of tedious tasks that agents have been doing manually can be automated, but that gives them the flexibility to handle the more complex problems.“The agent remains integral to this; we are a long way from the idea that this doesn’t require an agent to be involved,” she says. Like all consumer-facing brands Lola is keen to show that it’s all about putting the customer first but as a commercial organisation, whose first stage investors have come back to the table in round 1, it must also deliver returns. “The team has raised a tonne of money and we have a lot of work to do, so pressure is on,” Pappas admits. While positive feedback from users is the end game, like other agencies its business model is commission-based so it cannot ignore the importance of building the right partnerships. Lola’s promise to the travel suppliers it chooses to work with is “to complement their own marketing programme”. Already it is working directly with hotels, as well as other third-party suppliers and global distribution systems Amadeus and Sabre. Pappas is clear that Lola is not trying to take control of hotel loyalty data, which it could be argued is Expedia’s goal for its relationship with Red Lion, and ultimately other smaller chains. Last year, the online travel giant convinced Red Lion to allow it to auto-enroll guests to its hotel loyalty programme, in a move some commentators have called shortsighted. Not so for Lola. “We want to ensure our customers are getting the best rate from hotels, that their loyalty is in check and that hotel recognises them when they arrive,” she explains. Next steps for the firm are to “use the dough from the Series B funding round to for continued product development and marketing”; to date marketing efforts have been largely word-of-mouth. Though the idea is still germinating, a longer-term vision is to become the Uber of the travel agency world, with Lola talking through the idea with prospective partners. English and Pappas have been in the business long enough to know that it is trust too that will set them apart. “It’s truly amazing when you know you can trust somebody to book travel for you,” says Pappas. As Lola ramps up to deliver on this vision, the industry will be watching closely. Krista Pappas, Daniel Houghton and Bobby Healy will be speaking alongside other online travel industry innovators at EyeforTravel’s San Francisco Summit (April 24-25). Click here for details. Are Travel Brands Failing to Capitalize on Own-Brand Traffic? For every customer that makes a booking on your site, it is highly likely you have already digitally encountered them. That’s the conclusion of EyeforTravel’s new Understanding the Travel Consumer’s Path to Purchase white paper. It looks at real purchase data from more than a quarter of a million consumers across five countries and found that three quarters of consumers will visit and then leave a travel site, before coming back to it to complete their purchase. The research looked at Online Travel Agency (OTA), airline and hotel verticals, tracking the 15 sites a consumer looks at before they make a purchase. OTA sites were visited between 73% and 78% of the time before conversion, airlines between 69% and 84%, and hotels between 69% and 70%. This suggests that all types of travel brands should aim to convert these visitors first time and optimizing their sites so that consumers don’t feel the need to shop around. This is particularly the case for hotel brands, as the white paper finds that their conversion rates lag noticeably behind airline and OTA desktop conversion rates in Brazil, India and Germany. Furthermore, across all geographies both airline and hotel brands have substantially lower conversion rates for mobile bookings in comparison with OTAs. EyeforTravel and Jumpshot tracked more than a quarter of a million travel purchasers across five countries through clickstream data and consumer surveys to build a picture of the path to purchase. The white paper details the how, where and why of the decisions people make before they book, and identifies what travel brands should be doing to capture market share. To download the complete white paper and find all the research click here. More than half of visitors to travel websites are now using mobile devices in Brazil, India, the UK and the US reports EyeforTravel’s Understanding the Travel Consumer’s Path to Purchase white paper. This rises to two thirds of consumers in India, where smartphones are more important for accessing the internet. 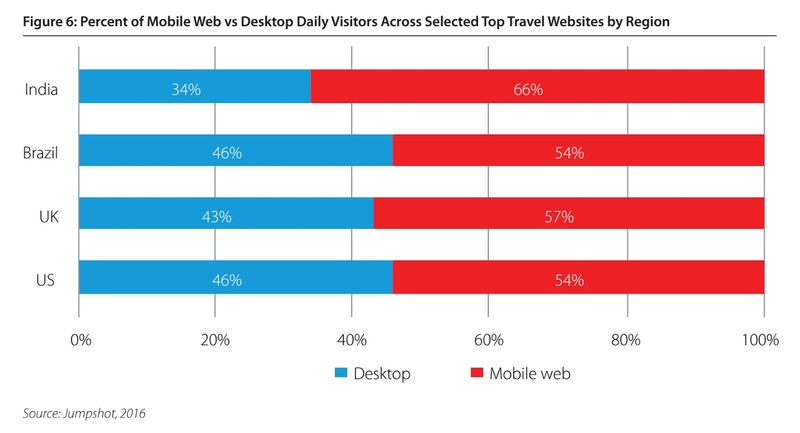 In Brazil and the US 54% of daily visitors to travel sites used mobile devices, with a slightly higher 57% doing so in the UK. The data was captured using clickstream data from white paper partner Jumpshot’s panel of more than 100 million consumers, which tracked visitors across major travel sites in each country. However, the paper notes that travel brands cannot increase focus on one channel at the expense of another, as consumers are largely adopting a multichannel approach to researching and then purchasing travel, with different devices more important at different stages of the process. Data presented in the paper shows that consumers frequently cross over from primarily using mobile devices to research their travel options, to desktops and laptops in the purchase phase. Desktop conversion rates are also considerably higher than for mobile in all the countries studied, further demonstrating that, for the time being, desktops and laptops remain the primary booking devices, if not the main drivers for research. To download the complete white paper and read all the research click here. Are air fares on the up in 2017? Last year was a good one all round for air travel. Consumers were able to benefit from declines in prices whilst airlines reported excellent profits. However, has this trend now flipped around? It seems like prices may now be on the up. Underlying this is the rising cost of jet fuel kerosene. Prices plummeted in 2014 and remained through 2015, allowing consumers and the industry to profit. 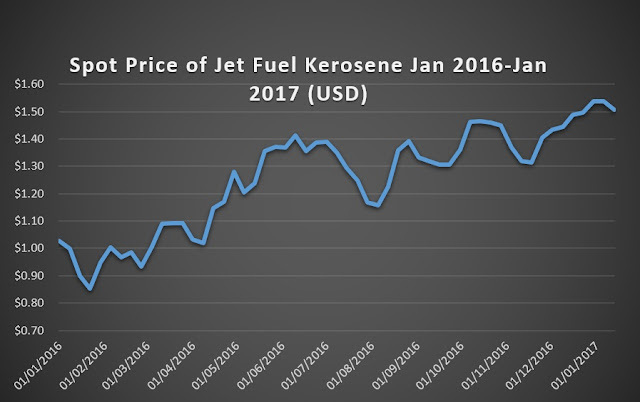 However, in 2016 fuel prices have turned around and look set to continue on an upward trend. 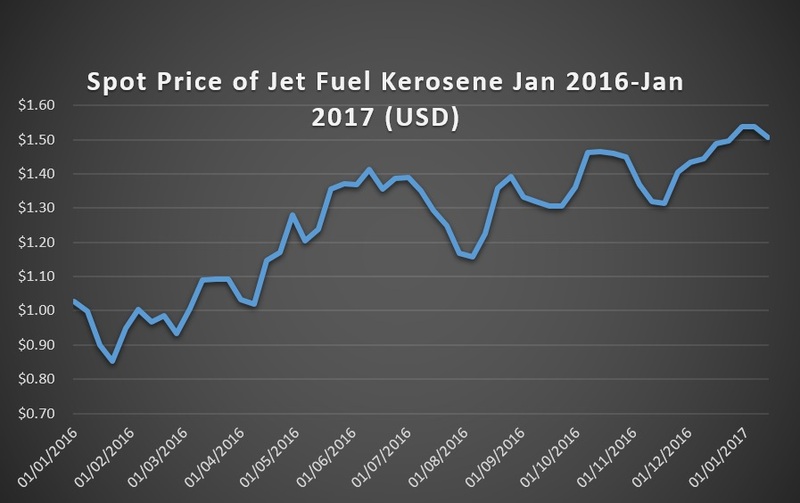 Year-on-year from mid-January 2016 to the same point in 2017, kerosene spot prices rose 68%. This, along with higher labour costs, is cutting into airline profits. IATA expects 2016 to have been the high point for airline profits and several major airlines, including Delta, United, Emirates and Easyjet all reported declining profits in the latter half of 2016. Already, Hopper reported in January that US flight prices were up 8% on the previous year and CWT and the GBTA expect global rises of 2.5% in 2017. On average, a fifth of travel consumers visit a social media site immediately before purchasing a vacation according to new research from EyeforTravel and Jumpshot. Social media domains continue to be visited late into the travel funnel, with users regularly connecting with a social media site within 15 sites of their final purchase destination. This was one of the findings from EyeforTravel’s Understanding the Travel Consumer’s Path to Purchase white paper. This used clickstream data gathered through research partner Jumpshot’s panel of more than 100 million customers, tracking consumers who made a purchase on an airline, hotel or Online Travel Agency (OTA) brand in Brazil, Germany, India, the UK and US. In all countries and purchase paths measured, social media sites were visited in at least 15% of the cases, rising to just under a quarter of those booking on OTAs in the UK and US. Additionally, 6% to 12% of consumers visited YouTube in their pre-purchase path, pushing the usage of social media up further. The white paper details the how, where and why of the decisions people make before they book, and identifies what travel brands should be doing to capture market share. Online Travel Agencies (OTAs) are leading the competition when it comes to online engagement, particularly with regards to mobile traffic, according to new research from EyeforTravel and Jumpshot. 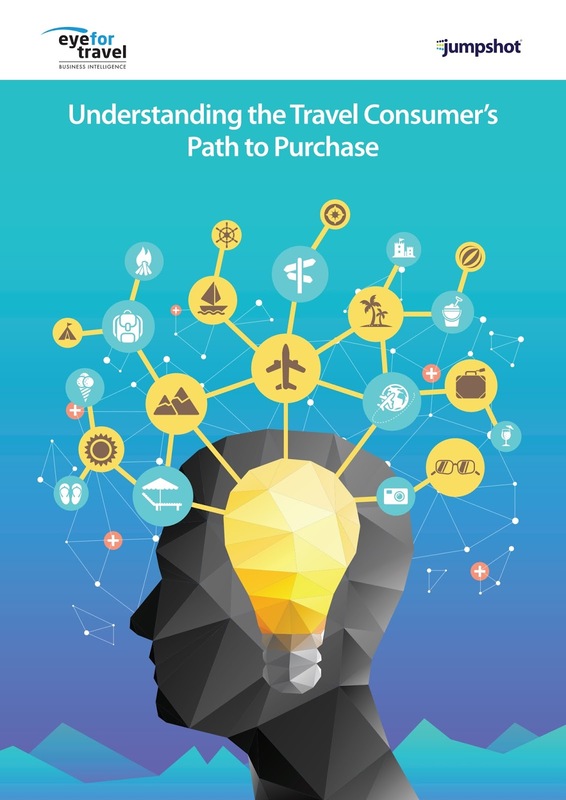 Over the last 18 months, hotels and airlines have been on a drive to win customer loyalty, but EyeforTravel and Jumpshot’s new Understanding the Travel Consumer’s Path to Purchase white paper shows they still have a long way to go. According to both clickstream data gathered by Jumpshot from more than a quarter of a million travel purchases and EyeforTravel consumer surveys, OTAs are winning more bookings than travel suppliers, and by a noticeable margin. 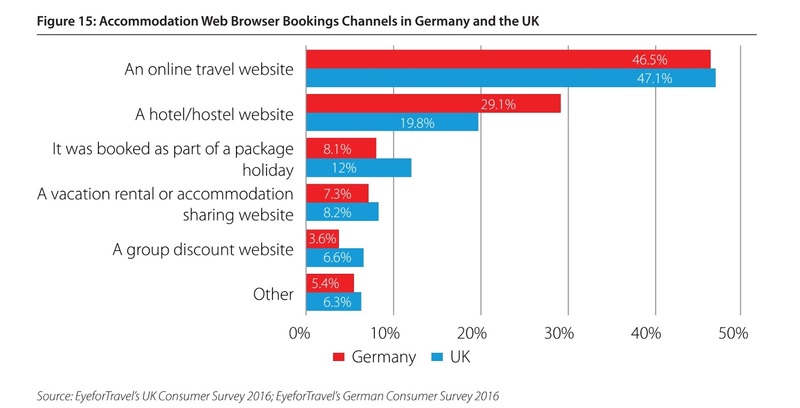 In Germany, the UK and the US OTAs represent the largest vertical, taking a greater number of bookings than airline and accommodation brands. In the US, the paper compared clickstream data tracking purchases made on Booking.com, Expedia.com, Airbnb.com, Hotels.com, Delta, Southwest, United, Ryanair, Easyjet, Lufthansa, Emirates, Marriott, Hilton IHG and Wyndham. It found that OTAs were responsible for 42% of the bookings made in the period measured, against 39% for airlines and just 19% for hotel brands. In the UK and Germany, consumer surveys of nearly 4,500 travellers presented in the paper revealed that OTAs controlled 46.5% and 47.1% of the bookings made on web browsers across all devices in the two countries. Even when consumers finished their purchase on a hotel or airline site, they were more likely to have visited an OTA site along the way than a hotel or airline site. For example, 33% of German consumers who bought a flight through an airline also visited an OTA along the way but just 13% also went via a competitor airline brand.